While welcoming new life into the world is always a joy, welcoming mold into your home is probably not on the same level. Molds are a type of fungi or mildew that break down and digest organic matter. Though a natural organism, they are usually very unwelcomed indoors and with good reason. Molds reproduce by producing microscopic spores that travel through indoor and outdoor air easily with just a passing breeze. The spores themselves are found everywhere in dust and throughout the air. 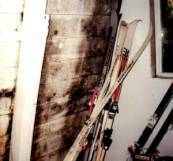 But indoor mold only grows when there is added moisture like from a damp spot. As molds grow they digest what they are growing on. Like all organisms, mold depends on a source of food and on a source of water to survive; however it does not need a great deal of either one. Sources of food can be anything organic from discarded pieces of good to paper, cloth, wood or even soil. Very little condensation goes a long way. Mold can live off the moisture of a small faucet leak or the humidity from a windowsill. While temperatures may favor one species of mold over another, mold as an organism can grow in cold and hot temperatures. While mold life is a civilization all in its own, and is fascinating to read about, it is surely not the type of organism you want to study in your own home. Mold can damage buildings and destroy furniture. It can rot types of wood and drywall, and cause unsightly stains. Most importantly, prolonged exposure to indoor mold poses serious health risks to human beings, the far more important organisms. Molds can produce substances that provoke allergies, irritate asthma cases and even possibly produce toxic chemicals that are poisonous. Indoor mold is wanted dead or alive-it can harm you in either state. One very common situation in which mold flourishes is the aftermath of a flood. Even after you rid your home of all the water, there are still many puddles and damp spots throughout the house, which are prime real estate for mold life. Since there is organic matter in virtually everything, a damp spot may be all that mold needs to make your home its home. Thankfully you don't have to let mold become your newest tenant. There are ways to eliminate molds from building up in your house and even ways to terminate them if they've already started growing. The next series of articles will deal with specific ways to get rid of this organic nuisance.